I would never have known about The Thousandth Floor, were it not for the enthusiasm I sensed from my friend Kristin about it. What sealed the deal for me was hearing it was like Gossip Girl set in a futuristic world. If you know anything about me, it's that I actually quite enjoyed Gossip Girl (the show and the books), and so, I was more than ready to read this story. Thankfully, I wasn't disappointed! The novel was exactly what it had promised to be - science fiction x Gossip Girl. I was completely swept up in the lives of these complicated teens from beginning to end, and it was definitely one drama-filled read. Before I get ahead of myself, let me tell you a little bit about The Thousandth Floor. As I previously said, this is a story set in the future, specifically in Manhattan 2118 where there's a tower with a thousand stories that covers the entirety of the city and technology we can only imagine (for now). It is told from multiple perspectives: Leda Cole (a girl recovering from heartbreak and a drug addiction), Eris Dodd-Radson (a girl whose idyllic life falls to pieces at the hands of betrayal), Rylin Myers (a girl from the lower floors hired to work amongst the wealthy who never imagined romance would find her there), Avery Cole (a girl designed to be perfect in every way) and Watt Bakradi (a tech genius who knows everything about everyone - or can find things out). Each of their lives intertwines with the others in unexpected ways, but one incident ties them all together. 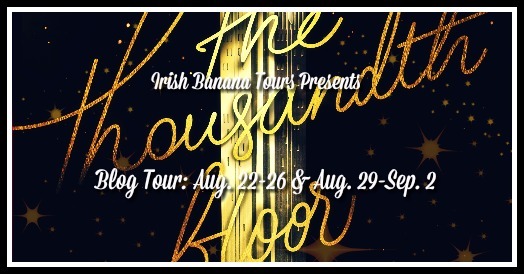 If you're looking for a book fix to satisfy your craving for Gossip Girl, Pretty Little Liars and series of that vein, The Thousandth Floor would be an excellent fit. It's got a very similar tone and plot progression, and it's a quick read. I definitely had a favorite character POV (Eris, if you must know), but I liked having the multiple POVs because it enabled me to have a wider look at the world (and I thought the author did a great job integrating technological and scientific upgrades into this futuristic society) and various plots to vie for my attention. It also contributed to the feeling that I was witnessing a teen TV drama unfold before my eyes which, in the case of this book, was exactly what I was expecting-slash-hoping for. Though I didn't personally connect to anyone, I did find that the plot moved steadily forward and I couldn't stop reading once I'd started. Basically, The Thousandth Floor was a fun, diverting sort of read. If you go into it with managed expectations (also known as just remembering that this is very similar to Gossip Girl and Pretty Little Liars), then I think you'll enjoy it just as much as I did. I was pretty surprised by how much I wound up liking this one, and I definitely plan on checking out the sequel (which doesn't exist yet, but I certainly hope it will). New York City as you’ve never seen it before. A thousand-story tower stretching into the sky. A glittering vision of the future, where anything is possible—if you want it enough. Welcome to Manhattan, 2118. A hundred years in the future, New York is a city of innovation and dreams. But people never change: everyone here wants something…and everyone has something to lose. Leda Cole’s flawless exterior belies a secret addiction—to a drug she never should have tried and a boy she never should have touched. Eris Dodd-Radson’s beautiful, carefree life falls to pieces when a heartbreaking betrayal tears her family apart. Rylin Myers’s job on one of the highest floors sweeps her into a world—and a romance—she never imagined…but will her new life cost Rylin her old one? Watt Bakradi is a tech genius with a secret: he knows everything about everyone. But when he’s hired to spy by an upper-floor girl, he finds himself caught up in a complicated web of lies. And living above everyone else on the thousandth floor is Avery Fuller, the girl genetically designed to be perfect. The girl who seems to have it all—yet is tormented by the one thing she can never have. Thanks to the lovely people over at Harper Collins, three (3) winners are going to receive a finished copy of The Thousandth Floor. This giveaway is US only, sponsored by Harper Collins, and all you have to do is enter via the Rafflecopter form below.